Tony Blair says something that’s true! Well what did his critics expect? An admission that he’d got Iraq terribly wrong? Blair breaking down in tears and begging forgiveness from Rose Gentle? A confession that he’d personally sexed up the dodgy dossier and/or grabbed Lord Goldsmith by the testicles the better to concentrate the attorney general’s mind on the legality of the invasion ? I’d say that’s a pretty fair assessment of Blair’s extraordinary performance yesterday, and a pretty fair assessment of a man who is the ultimate relativist: for him, the concepts of truth and lies are not absolutes, governed by objective reality, but entirely subjective matters, governed by whatever Anthony Charles Lynton Blair Esq happens to believe at any given moment. Unfortunately, the Graun‘s coverage seems to be largely made up of comments from the tyrants’ friend G. Galloway MP, and other sworn enemies of democracy and human rights. Funny how the anti-war “left” in Britain and the US today, increasingly resembles the isolationist, pro-appeasement right of yesteryear. Mind you, many of those individuals (Clare Short , John Cruddas, Peter Wilby) and publications (the New Statesman and the Graun itself) who now denounce Blair as a madman/liar/warmonger/poodle/megalomaniac, etc, etc, would not hear a word against him when he seized the leadership of the Labour Party in 1994 and wagged their “realist” fingers at those of us who expressed doubts, telling us that we were infantile ultra-leftists, who needed to come to terms with the modern world of Blairite compromise and consensus. Blair, it is clear, is incapable of distinguishing between truth and falsehood, fact and opinion, disarmament and regime change. But he said one – just one – true thing yesterday: Saddam Hussein was, indeed, a “monster” and the world and (especially) the peoples of Iraq are well rid of him. Sadly, that’s not something that the likes of George ‘Haw Haw’ Galloway, Lindsey German and the isolationists of the ‘Stop The War Coalition’ can accept. Which is why their morality and veracity is at least as flawed as Bliar’s. This is also in memory of a great friend, the clarinet and sax player Mike Turner, who died much too young, last year. Mike was a hot jazz player who was also a committed Francophile, and loved the ‘bal-musette’ tradition of people like Charles Trenet: Mike would occasionally burst into song on a gig, and ‘J’Attendrai’ was one of his favourites. Sadly, I don’t think he was ever recorded singing it. He left us just four slim volumes and I’m still not sure whether any of them are particularly good. But ‘Catcher’ is inescapably part of my adolescence (yours too, I bet). And I once knew a girl called Esme who claimed she was named for ‘Love and Squalor’. THAT’s all I’m going to tell about. I could probably tell you what I did after I went home, and how I got sick and all, and what school I’m supposed to go to next fall, after I get out of here, but I don’t feel like it. I really don’t. That stuff doesn’t interest me too much right now. D.B. isn’t as bad as the rest of them, but he keeps asking me a lot of questions, too. He drove over last Saturday with this English babe that’s in this new picture he’s writing. She was pretty affected, but very good-looking. Anyway, one time when she went to he ladies’s room, way the hell down the other wing, D.B. asked me what I thought about all this stuff I just finished telling you about. I didn’t know what the hell to say. If you want to know the truth, I don’t know what I think about it. I’m sorry I told so many people about it. About all I know is, I sort of miss everybody I told about. Even old Stradlater and Ackley, for instance. I think I even miss that goddam Maurice. It’s funny. Don’t ever tell anybody anything. If you do, you start missing everybody. 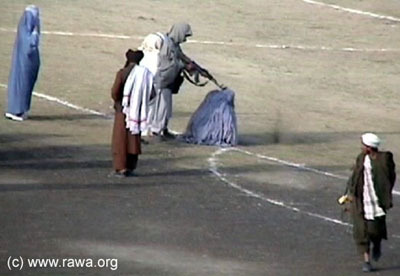 Don’t betray Afghan women in the name of “peace”! Peace is – generally – good, and war is – always – bad. There can be little doubt that to achieve something that can be called “peace” in Afghanistan some distasteful deals will have to be done. Just as in order to get rid of the Taliban govenment in 2001, the West had to do deals with warlords who were little better (if any better) than the Taliban. And it’s worth remembering that whatever the costs in human terms of the war (and I write as someone who opposed it from the start), women in Afghanistan have gained significant rights (especially in education) over the last nine years, despite savage attacks from the Talibs – including the dreadful murders of brave women teachers (torn – literally – limb from limb) and disfiguring acid attacks upon women students, by these gynophobic rural fascists. * Ensuring women’s representaion in peace processs. Consistent with constitutional guarantees for women’s representation, women must comprise at least 25 percent of any peace process, including any proposed upcoming peace jirgas. They must be represented in any national and local security policy-making forums, such as the Afghan President’s National Security Council. * Guaranteeing that reconciliation protects women’s rights. The government and international community must secure and monitor women’s rights in all reconciliation initiatives so that the status of women is not bargained away in any short-term effort to achieve stability. *Implementing a gender-responsive security policy. All efforts to enhance security in Afghanistan must better serve women. Further to Jim’s piece below, Seismic’s story got me into a fury. The political history of this country is of the government extending its powers, the people pushing back. A mass repetition of Seismic’s story on all blogs would be one small shove. “Khun is out of his senses. Does he not see Beppo the Greek in the bunk next to him, Beppo who is twenty years old and is going to the gas-chamber the day after tomorrow and knows it and lies there looking fixedly at the light without saying anything and without even thinking anymore? Can Kuhn fail to realise that next time it will be his turn? Does Kuhn not understand that what has happened today is an abomination, which no propitiatory prayer, no pardon, no expiation by the guilty, which nothing at all in the power of man can ever clean again? …And on Holocaust Day,, I note that Christian anti-semitism is still alive and well. Message to the Rev Stephen Sizer; you are a vile little anti-semite and if you want to call the cops on me, Jim Denham, for saying that, so be it. I’ll be glad to meet you in court and call you and your version of the Anglican Church for what you are. Go for it, you miserable, dog-collared anti-semite! We all use the term “genius” too readily. But the Belgian-born gypsy Jean Baptiste “Django” Reinhardt (born 100 years ago today) probably deserves that description. He pioneered a style of jazz guitar playing that still astonishes and captivates (and not just jazz specialists) 70-odd years later. 2/ His left hand had been badly injured in a fire, leaving just two fully-functioning fingers and a thumb to make the chord positions. The first of these wouldn’t matter so much these days, as European jazz has long been accepted as the equal of anything coming out of the US (albeit by adopting some pretty turgid “folk” influences well described by one critic as “motionless pastoralism”); but in Django’s day even the best European musicians were considered merely talented copyists of the American originators. Django was the first European jazz musician to establish himself as a distinct and unique player who transcended and surpassed his main American model (the Italian-American guitar pioneer of the 1920’s, Eddie Lang). Django and Grappelli were not an obvious pairing either musically or personally. Grappelli in the 1930’s was a very ‘correct’ and rather restrained violinist who could play a very ‘polite’ form of jazz, but had nothing like the fire and verve of his US opposite number and model, Joe Venuti. Grappelli wasn’t even Django’s first choice as violinist in their famous group the Quintette du Hot Club de France: Django had wanted to use the now almost forgotten Michel Warlop, but for some reason Warlop wasn’t available. Nevertheless, Grappelli and Reinhardt formed a team that is, these days, far better remembered than their American models Venuti and Lang. Grappelli, whatever his personal frustrations with Django, made a comfortable living out of his association with the “gypsy genius” and the Quintette until his own death in December 1997. Be that as it may, there is no doubt that Django was the first European musician to be accepted as a musical equal by such black American giants as Coleman Hawkins, Benny Carter, Rex Stewart, Dicky Wells and Bill Coleman (all of whom recorded with him in Paris in the late thirties), and even Duke Ellington (who brought him over to the US for a brief and not entirely successful tour in 1946). Django died of a stroke at the age of 43. By then Charlie Christian’s modernistic advances on amplified guitar and the arrival of bebop had begun to eclipse his pre-eminence. But all the signs were that Django was preparing to hit back: on his very last recordings he successfully switched to an amplified instrument and showed some understanding of bop. We’ll never know how he would have developed. But the rich and extensive recorded legacy is plenty to be grateful for. In January 1950, his health broken by the effort of completing Nineteen Eighty-Four, George Orwell was planning to go to a sanatorium in Switzerland. He never made it. On the night of 21 January 1950, his tubercular lung haemorrhaged and he died alone in a London hospital bed.